We’re getting ready for Christmas around here, and here are just a couple things I’ve made as part of the preparations. I was planning to knit fancy colorwork stockings (one for each member of the family), so we’d have one for the little guy, but after getting nearly half done with the first one, I ripped it out because I wasn’t pleased with how it was turning out. I’ve since practiced my stranded colorwork skills a bit, and I might be ready to tackle that gorgeous stocking again, but there’s no way I could get it done in time, and I still needed a stocking for him for this year. When I saw this pattern, worked in worsted weight and not horribly ugly (which it seemed all the other stocking patterns I’d found were), I decided to just knit one. I knew I wouldn’t be thrilled with anything I found to buy, either. (Rav project page) It benefitted greatly from blocking (duh), and I’m happy with my modifications (the contrasting heel and toe, the loop for hanging). I think I’ll be happy to have a spare stocking in the future, too. 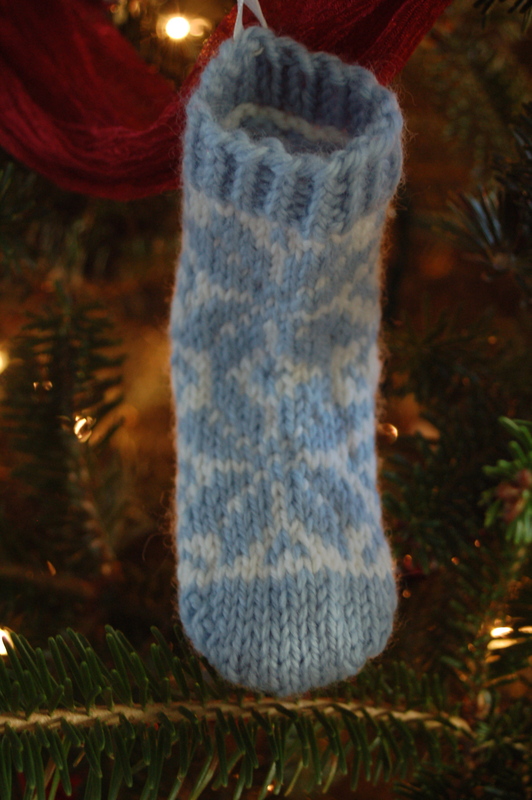 I also, in my colorwork practice, ended up with an ornament to commemorate the babe’s first Christmas. I actually started, along with the aforementioned colorwork practice, to make Flakey Baby Socks as a pair of socks for Asa. Instead, I tried the first sock on him before beginning the second, and while it fit, getting it on him required a wrestling match (kinda tight). There certainly wasn’t room to grow. That paired (heh) with the frustration I experienced with the afterthought heel and, well. I decided to just use the first one as the ornament for his first Christmas. As an added bonus, we’ll be able to remember how big/little his feet were at this point in time. From this view you can see the snowflakes. I was much happier with how this turned out after I’d blocked it. I shouldn’t be surprised, but blocking really is a wonder-worker in the colorwork realm. My tension looks so much better after this little thing had a bath! It’s quite different than the simple brass ornament that commemorated my first Christmas, but I think it’s fun. Do you have an ornament from your (or your child’s) first Christmas? 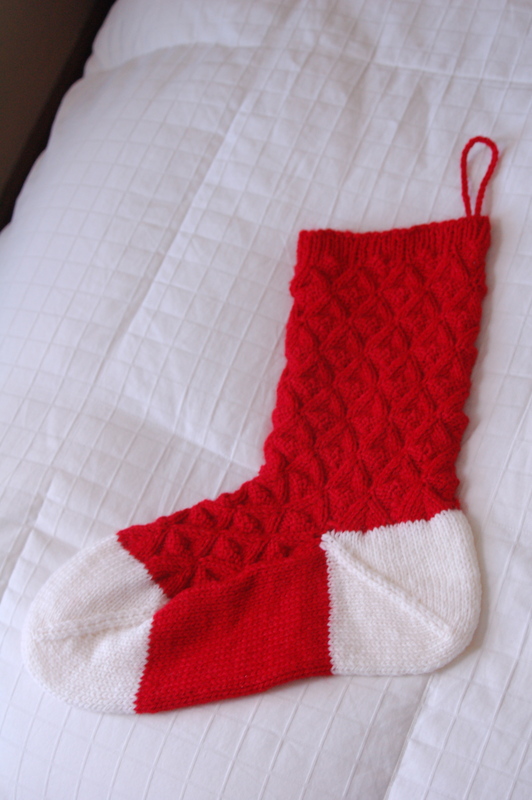 This entry was posted in knitting and tagged Christmas, fiber arts, Sprout. Bookmark the permalink. Both stockings are so sweet! Have a very Merry Christmas. I love the little sock as an ornament. We have quite a few ornaments that started their lives as other things. I do have an ornament for our son’s first Christmas. aw so cute! well done. These stockings came out beautifully! Blocking is quite the miracle worker, isn’t it? I made color work mittens a few years ago. It’s quite a time investment. Reader and knitter…how come we’ve never met until now? 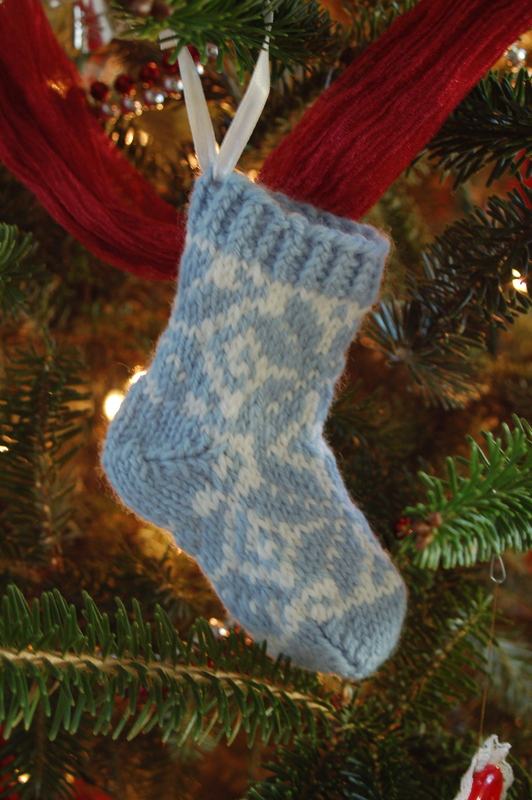 OOH love the socks – the ornament sock is adorable! You are so talented. I love the ornament.